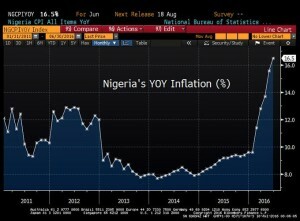 Nigeria Gists: Nigeria’s inflation rate now 16.5%; ...highest point in 11 years! Nigeria’s inflation rate now 16.5%; ...highest point in 11 years! The Consumer Price Index (CPI) measuring inflation in the Nigerian economy has risen to its highest point of 16.5 per cent since 2005. Report released by the National Bureau of Statistics (NBS) shows that inflation for the month of June spiked to its highest point since October 2005 — 11 years. Inflation rose from 15.6 percent in May 2016 to 16.5 percent in June 2016, as energy and food prices weigh in heavy on inflation for the month. “In June, the Consumer Price Index (CPI) which measures inflation continued to record relatively strong increases for the fifth consecutive month. The Headline index increased by 16.5% (year-on-year), 0.9% points higher from rates recorded in May (15.6%),” NBS said. “Most COICOP divisions which contribute to the headline index increased at a faster pace, the increase was however weighed upon by a slower increase in three divisions; Recreation & Culture, Restaurant & Hotels, and Miscellaneous Goods & Services Year on year, energy prices, imported items and related products continue to be persistent drivers of the core sub-index. Asides farm produce, the core sub-index increased by 16.2% in June (year-on-year), up approximately by 1.2% points from 15.1% recorded in May. Inflation has increased consistently since October 2015, with the change in exchange rate policy, in the latter part of June expected to weigh in on inflation for the month of July. Goldman Sachs, an American multinational banking and investment firm, forecasts that Nigeria’s inflation will not rise above 20 percent in 2016, before it takes retreats to lower levels.